David Gentleman has been drawing London all his adult life. But can you look afresh at the place where you live? Over the past year he has immersed himself in his home city to try and find out. London, You're Beautiful, the resulting book of sketches, drawings and watercolours, arranged month by month, shows a year in the life of London, and reveals the city that is hidden in plain view. David's notes on his work offer us a privileged insight into how an artist sees and captures the ever-shifting light and colours, movement and figures of a teeming city as it moves through the seasons. He describes how he chooses techniques and materials to render the spellbound children at his grandchildren's Camden primary school; the spectacular transformation of Hendon's streets from brown to pink to green with April's cherry blossom; the strange world evoked by the city under snow. 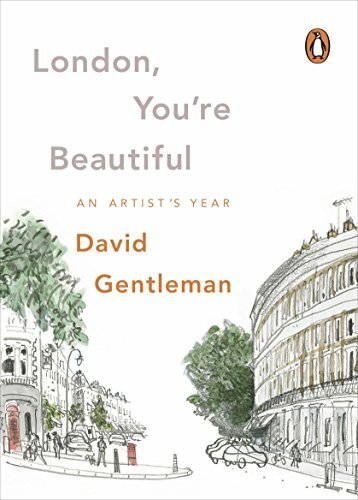 Through David's eyes we see London anew as he shows us how the sun turns rubbish-strewn ditches into enchanting waterside glades, or how just twenty-two lines on paper can deliver the dazzling complexity of Canary Wharf's windows. This book is for everyone who would like to understand how an artist works, for lovers of the Olympic city that will be celebrated in London 2012, and for those who long to see a familiar world, transformed. David Gentleman, born in London in 1930, is a watercolourist and printmaker, working in many media and scales. He has designed British stamps and coins and the platform-length mural at Charing Cross tube station, well-known to Londoners, that is blown up from his wood engravings. His studio is at the top of an early Victorian house in Camden Town between the crowded, rackety Camden Lock and the green spaces of Regent's Park and Primrose Hill.